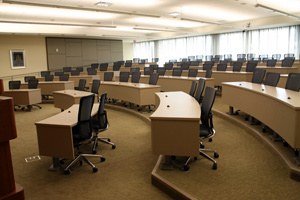 The classrooms of Ray & Kay Eckstein Hall are equipped with multimedia presentation equipment. Smart podiums have the equipment controls built into the podium while many seminar rooms have wall mounted equipment controls with LCD displays. All of the public areas of Eckstein Hall have wireless Internet access. Individual classroom training and instruction is available. Contact the Law School Media and Technology Group should you require any technology training in a classroom, or seminar room. Technology: smart podium, computer, laptop hookup, ceiling mounted projector, document camera, DVD/VHS player, microphone, audio recording available. Technology: smart podium, computer, ceiling mounted projector, document camera, DVD/VHS player, microphone, recording available. Technology: smart podium, computer, laptop hookup, ceiling mounted projector, document camera, DVD/VHS player, microphone, recording available. Technology: smart podium, computer, laptop hookup, ceiling mounted projector, document camera, microphone, and DVD/VHS player, audio recording only. Technology: smart podium, computer, laptop hookup, two ceiling mounted projectors, document camera, microphone, DVD/VHS player, recording available. Technology: suite of technology available in Trial Court (346), Jury Room (342B), and two breakout rooms (346A & 346B). A detailed description is here. Technology: smart podium, computer, laptop hookup, no recording available. Technology: smart podium, computer, ceiling mounted projector, document camera, and DVD/VHS player, microphone, recording available. Technology: smart podium, computer, laptop hookup, ceiling mounted projector, document camera, microphone, DVD/VHS player, recording available.